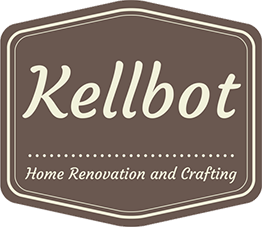 Making Toddler Clothes - Kellbot! | Kellbot! I put my new sewing machine through its paces making some clothes for Bitmap. 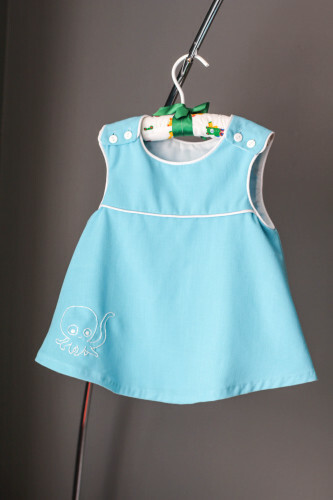 I like making toddler clothes a lot better than making adult clothes, because all the pieces of fabric are so small! No wrestling many yards of fabric on my floor, and I can make a dress with 1/2 yard of fabric. The first thing I made is a jumper using the free Vivienne pattern from BurdaStyle. I used a washable Linen blend and added white piping. I am now obessed with piping and will add it to all of Bitmap’s clothing. If you’ve never tried it before there’s a great tutorial here. Overall I’m happy with it, though I will probably practice a bit more with the buttonholer before sewing my next dress. 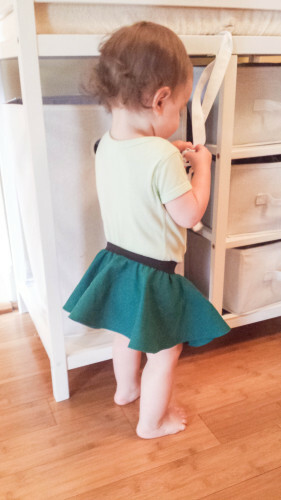 I also made a quick circle skirt to wear over onesies. It’s a good use for fabric scraps. You could probably even use a fat quarter if it’s for a small enough baby. Detailed instructions, including how to get a nice hem, can be found here. Beautiful work, Kell! I agree that toddler clothes are more satisfying (and quicker) to sew. Nice job on the piping, that probably took a lot of patience! If you go down in scale from here, you’ll probably find that Barbie clothes are frustrating to sew because they are TOO SMALL. hahaha. Spectrum of ease. Is there anything easy out there for a “toddler” boy? I agree children’s clothing is easier to sew! I use to make all the costumes for the neighbors and family, I loved doing them.I made a lot of clothes for nieces when they were younger also.I really miss that, Have fun!